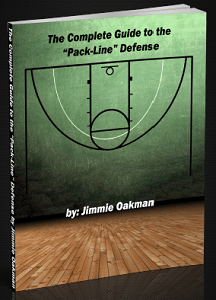 The Complete Guide to the Pack Line Defense is the most complete defensive eBook available all over the internet for the time being. With it you will have the opportunity to learn what transforms the best college basketball teams like Virginia and Arizona to successful defensive machines that no offense can win. Through this great basketball playbook you will understand the main principles of that defense: not only how it works, but why it works. You can use this philosophy if you don’t coach the most athletic team to put yourself in a position to win more games and convert your players to great defenders who will be able to destruct your opponent coach’s strategies. In case you have an athletic team, you can use it to take teams completely out of their comfort zone and destroy their attacking balance with great ball-pressure and gap responsibilities! Transition Defense, On-Ball Defense, Off-Ball Defense, Defending Screening Situations, Defending Ballscreens, Post Defense, Rebounding, and Defending Baseline Out of Bounds Situations. As you can see this is a huge basketball playbook that can help you get all the knowledge you need to implement this specific defense to your team practice and have your players use it in the games thay play. It will also help you teach them the basic principles of a basketball defense implemented by many teams in the college or professional level. After all, we -the basketball coaches- are primarily -or should be- teachers, preparing the next generation of professional basketball players, those who are going to succeed Lebron James, Dwayne Wade and the rest of the super stars of professional basketball. You can purchase this Pack Line Defense eBook today and prepare your team to win more games next season!